Publisher: The Beacon Press, 1956. Condition: Hardcover, with dust jacket. Tear to dust jacket (see pictures). Otherwise very good. Clean text. Schweitzer, as the world now realizes, is a pioneering mind: where he finds an unblazed trail, he forges ahead and makes his own discoveries. This book is his pioneering discussion of the essential differences between Indian and Western thought – undertaken because no such thoroughgoing study was available to him on the shelves of any library, so far as he could discover. The more he studied the documents of India’s great thinkers, the more he doubted that Europeans like Arthur Schopenhauer, Paul Deussen and others wer correctly interpreting them. Indian thought was presented as being completely governed by the idea of negation of life and the world. 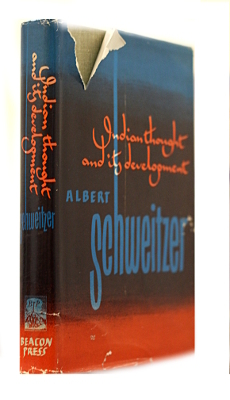 Back of the negation, Schweitzer saw affirmation. He saw the combination of these attitudes as the special character and determinant of Indian thought. He noticed also that while such men as Schopenhauer abandoned Western thought and substituted for it the negation of life – which was the Indian way as they saw it – neither Western thinkers nor Indian writers had made any real endeavor to understand the common purposes which characterized both types of thought. See pictures for contents of this book.